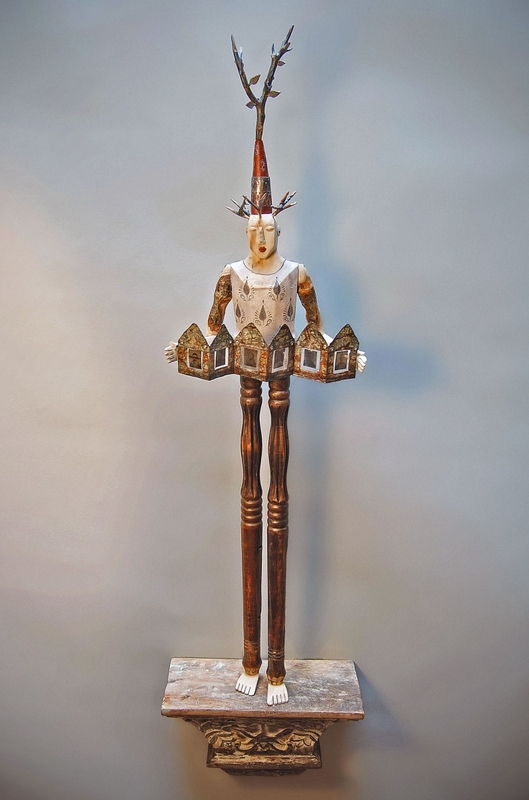 "My carving style is inspired by iconic images found in folk, tribal and primitive art. The themes I choose are personal yet universal. My love for the natural world and my concern for the environment translate into works about the complex relationship between humans and nature in this modern age." Arizona-based, American artist Elizabeth Frank feels a communion with trees. It began with a childhood spent exploring the outdoors. At age nine her family moved for several years to Olympia, Washington. There the rainforests near her home became her sanctuary. Now living in the Sonoran Desert she still visits the forests of Nothern Arizona or New Mexico at least once a year to gather aspen for her carvings. She thinks of each visit as a pilgrimage. After receiving a Bachelor of Fine Arts from Arizona State University Frank spent several years working in the film industry. On her jobs buying for and decorating sets she enjoyed transforming spaces to create believable locations. The quest to find the perfect objects to help propel a narrative ignited her love of found things. Now she incorporates this same quest into her artwork. A native of the desert southwest Frank spent most of her childhood just sixty miles from the US/Mexico border. Her father, a social worker, worked part-time in a border community. Her family often visited Mexico. As a young adult, she explored the country more thoroughly. Through those travels, she found great artistic inspiration. One such trip led to studies in language and sculpture in San Miguel de Allende, Mexico. Journeys near and far continue to inspire her. Her artwork can be seen in galleries and fairs throughout the United States. It’s been featured in television, film, and books. 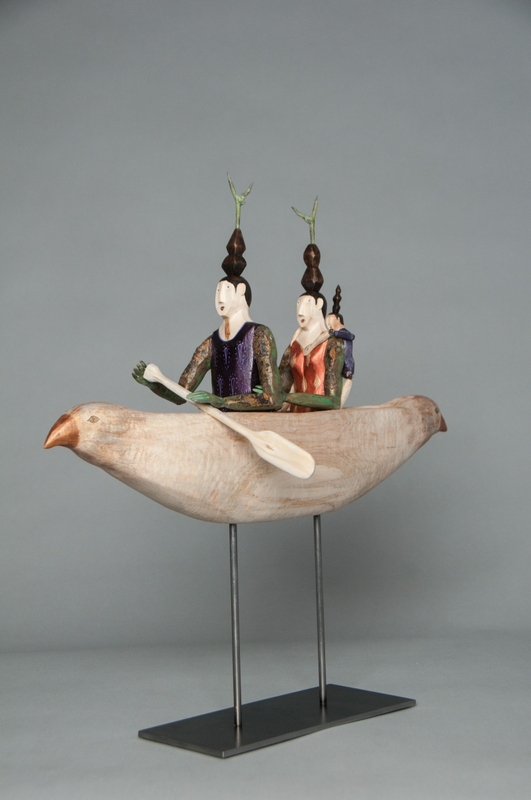 Elizabeth Frank is honored to have her pieces included in collections around the US and abroad. Book of Spirits - Carved fallen aspen, reclaimed wood, antique tintype photographs, tin, mica, acrylic paint, wax, 48 x 12.75 x 6.5 in. Migration - Carved fallen aspen, antique tin, found objects, mica, acrylic paint, wax, 84 x 16 x 16 in. 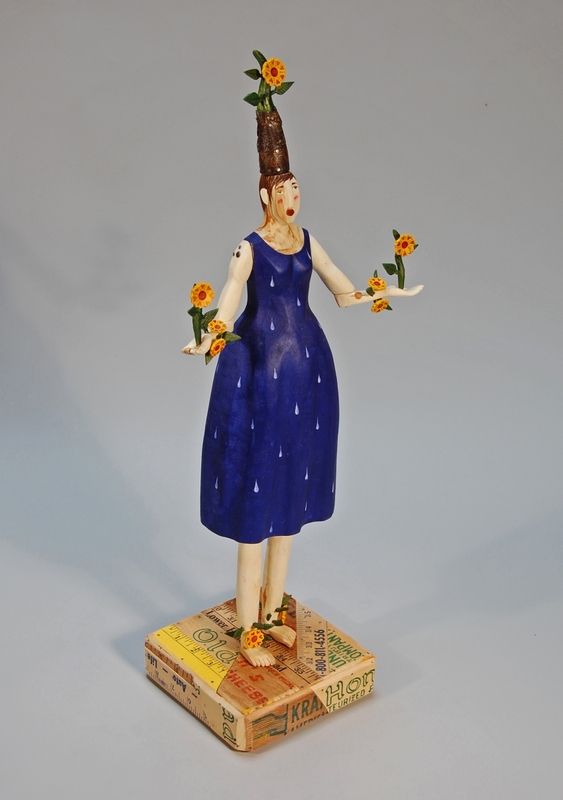 Wildflower Woman - Carved fallen aspen, reclaimed wood, tin, acrylic paint, wax, 26x 9 x 5 in. 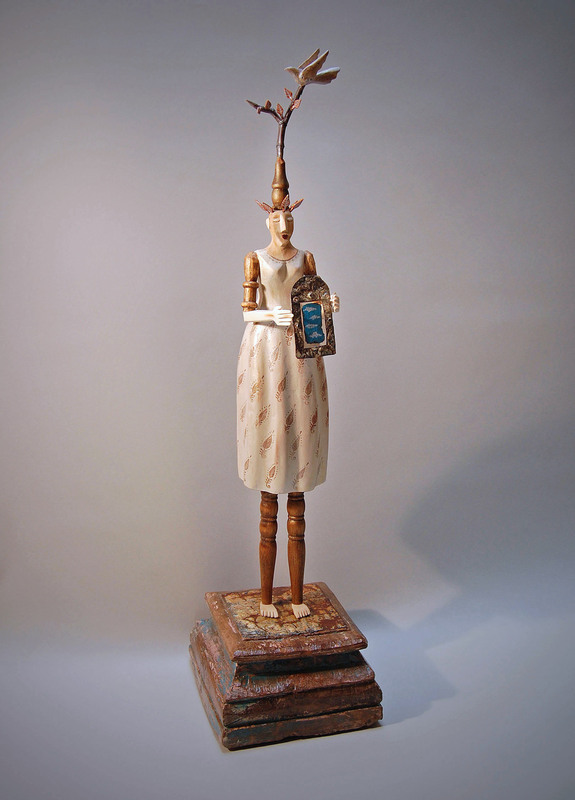 Cloud Woman- Carved fallen aspen, reclaimed wood, antique tin, amate bark paper, mica, acrylic, metal leaf, wax, 31 x 8 x 10 in. 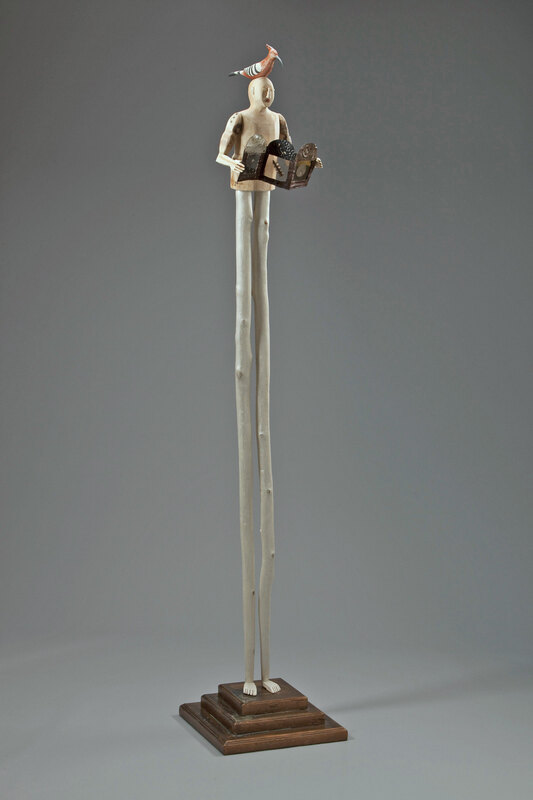 Migration #3 - Carved fallen aspen, bronze, acrylic paint, metal leaf, wax, 18.5 x 18 x 8 in.